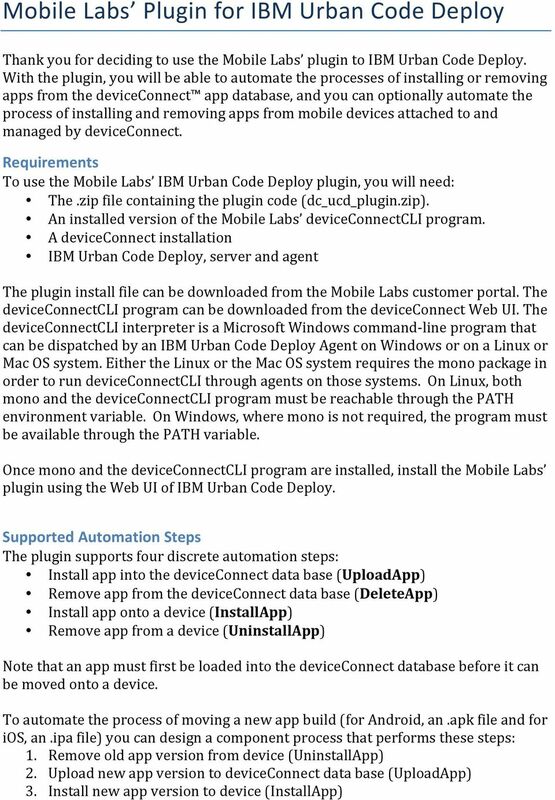 Download "Mobile Labs Plugin for IBM Urban Code Deploy"
2 Common Required Properties All properties passed to the plugin are simple text fields. All steps require the following properties: host the fully- qualified domain name of the deviceconnect host or its IP address username the login id of a deviceconnect administrator password the password for that account Step- Specific Properties For UploadApp only you must additionally supply the file name (fully- qualified path name) for the app to be uploaded. For DeleteApp you must additionally specify the app name as displayed on the deviceconnect app screen (as set by the developer). 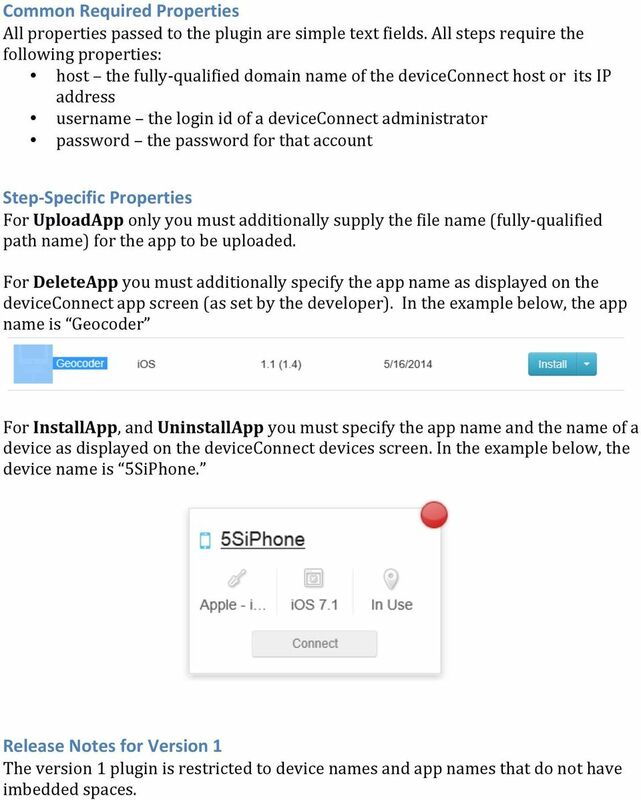 In the example below, the app name is Geocoder For InstallApp, and UninstallApp you must specify the app name and the name of a device as displayed on the deviceconnect devices screen. In the example below, the device name is 5SiPhone. 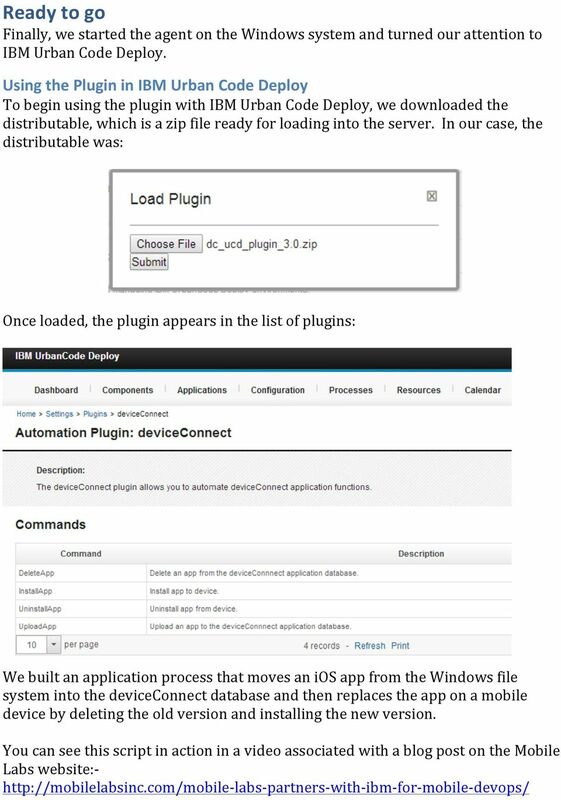 Release Notes for Version 1 The version 1 plugin is restricted to device names and app names that do not have imbedded spaces. 5 We used Notepad to create this one- line script file in the C:\Users\mlabs\ucd\deviceConnectCLI directory. 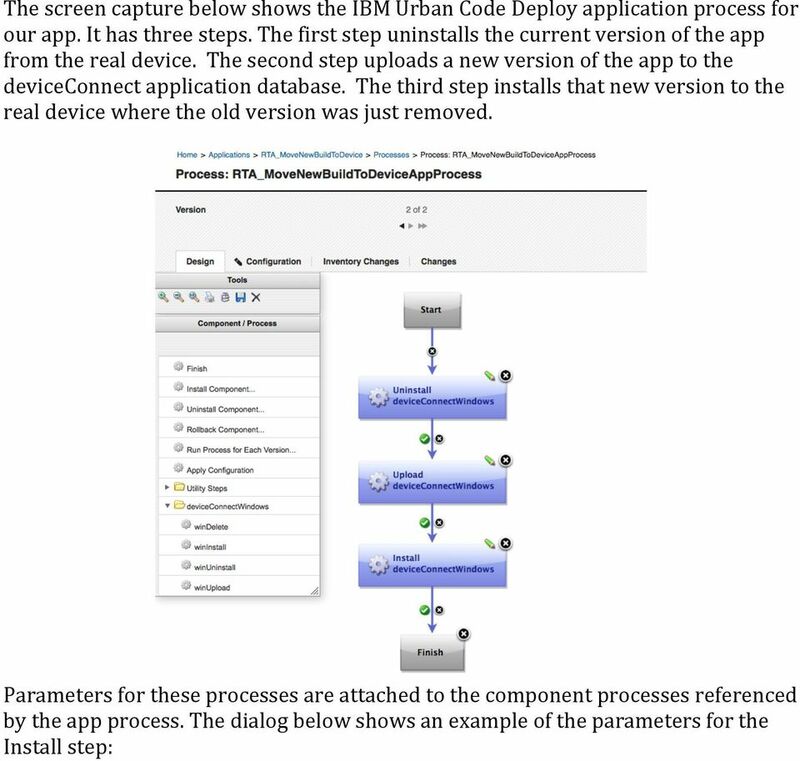 When the plugin executes mldc_invoke.cmd, it passes parameters from IBM Urban Code Deploy. The one- line script calls deviceconnectcli and passes any/all parameters along in the process (the meaning of %* ). 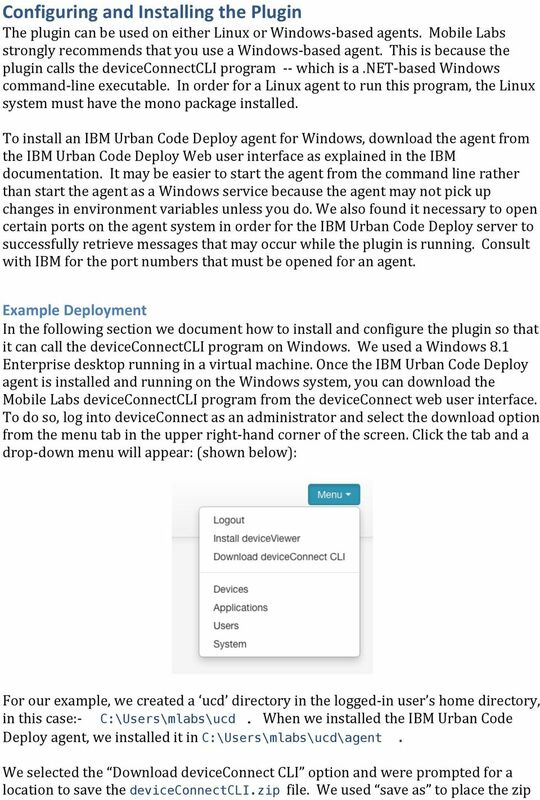 Installing an invocation script Linux If you are installing the agent on Windows, you can skip this section. If you are installing the agent on Linux, the script command is slightly different. The script must still be named mldc_invoke.cmd and must be marked executable (you can also create a symbolic link named mldc_invoke.cmd). 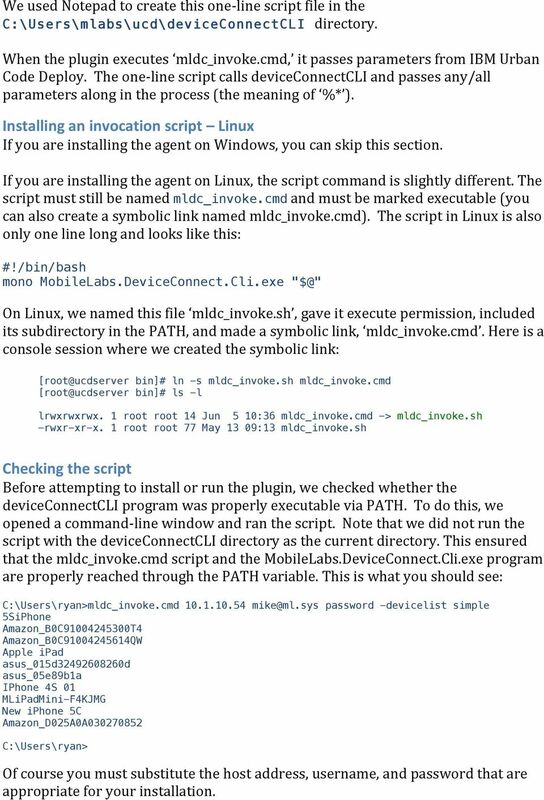 The script in Linux is also only one line long and looks like this: #!/bin/bash mono MobileLabs.DeviceConnect.Cli.exe On Linux, we named this file mldc_invoke.sh, gave it execute permission, included its subdirectory in the PATH, and made a symbolic link, mldc_invoke.cmd. Here is a console session where we created the symbolic link: bin]# ln -s mldc_invoke.sh mldc_invoke.cmd bin]# ls -l lrwxrwxrwx. 1 root root 14 Jun 5 10:36 mldc_invoke.cmd -> mldc_invoke.sh -rwxr-xr-x. 1 root root 77 May 13 09:13 mldc_invoke.sh Checking the script Before attempting to install or run the plugin, we checked whether the deviceconnectcli program was properly executable via PATH. To do this, we opened a command- line window and ran the script. Note that we did not run the script with the deviceconnectcli directory as the current directory. 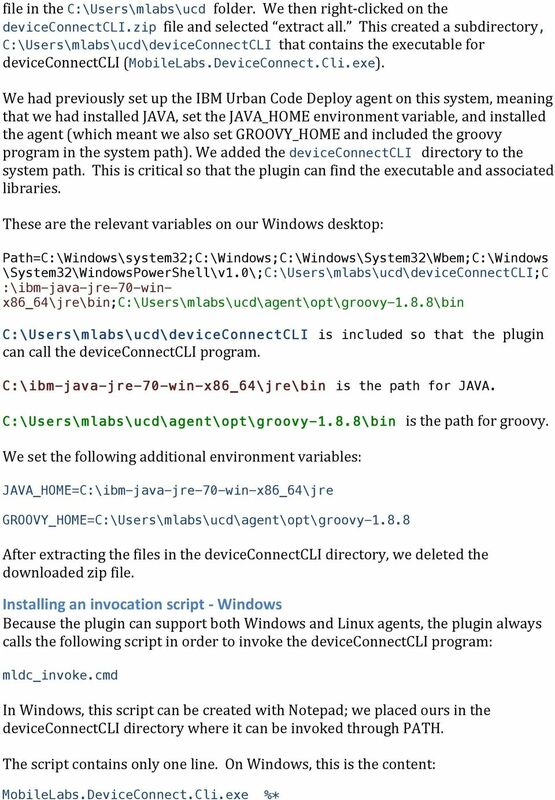 This ensured that the mldc_invoke.cmd script and the MobileLabs.DeviceConnect.Cli.exe program are properly reached through the PATH variable. This is what you should see: C:\Users\ryan>mldc_invoke.cmd password -devicelist simple 5SiPhone Amazon_B0C T4 Amazon_B0C QW Apple ipad asus_015d d asus_05e89b1a IPhone 4S 01 MLiPadMini-F4KJMG New iphone 5C Amazon_D025A0A C:\Users\ryan> Of course you must substitute the host address, username, and password that are appropriate for your installation. 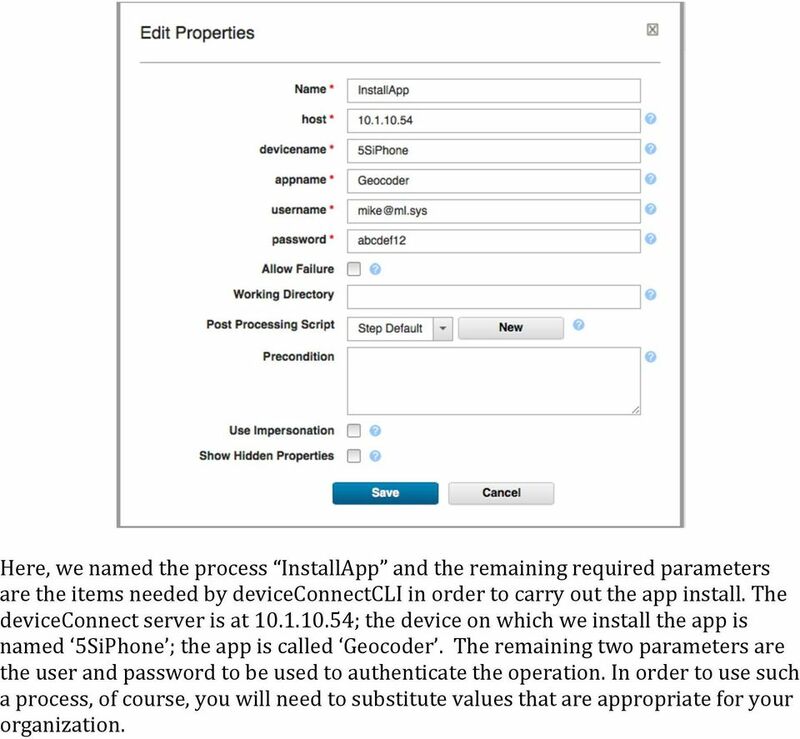 8 Here, we named the process InstallApp and the remaining required parameters are the items needed by deviceconnectcli in order to carry out the app install. The deviceconnect server is at ; the device on which we install the app is named 5SiPhone ; the app is called Geocoder. The remaining two parameters are the user and password to be used to authenticate the operation. In order to use such a process, of course, you will need to substitute values that are appropriate for your organization. ACCESSING CERNER ON A MAC (October 1, 2012) For any questions regarding these instructions, or for assistance with accessing Cerner from a Mac, iphone or ipad please contact Dr. Behra at jbehra@ematucson.com. SAIP 2012 Performance Engineering Author: Jens Edlef Møller (jem@cs.au.dk) Instructions for installation, setup and use of tools. Introduction For the project assignment a number of tools will be used.